Clear Quartz bonded with Platinum and Silver, exhibiting a light blue, rainbow, and silvery iridescence. The stone carries a very loving and sweet energy, stimulating the spirit and elevating one’s mood. Meditating with this crystal allows one to enter a state of serenity and peace, purification, and rest. It also helps in perceiving and receiving help from angels and spirit guides. It enhances loving communications and healing situations. It is great for dealing with anxiety, panic attacks, and phobias. 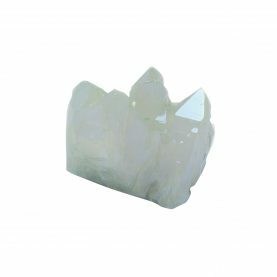 Clear Quartz bonded with Nickel, emiting s a fresh light green color. It helps combat any energy drain and serves as a shield against energy vampires. It assists in severing ties with previous partners or people who who have a mental or emotional hold over you despite physical separation. It is highly beneficial in bringing the body into balance. Clear Quartz bonded with Gold; named for its rich aquamarine color, it is the most popular of the Aura Quartzes. It has an intense vibration used for healing and is a potent stone for activating chakras. It has a calm, relaxing effect on the emotional body and is exceptional for releasing negativity and stress, soothing and healing the aura. 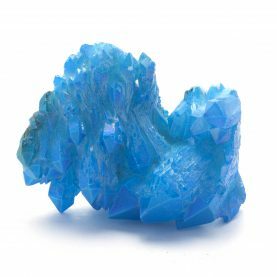 It particularly stimulates the throat chakra, enhancing one’s ability to express emotions in a constructive, positive manner and encouraging one to speak their truth from the heart. Aqua Aura helps in freeing one from limitation and creating space for something new. It brings peace during meditation, opening gateways to the angelic realm. It is believed to strengthen the thymus gland. 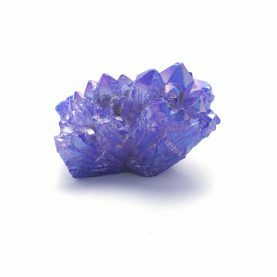 Clear Quartz bonded with Cobalt; exhibits shades of metallic blue and violet. It is wonderful for removing restlessness and discontentment and brings joy. It is an excellent aid to creativity. 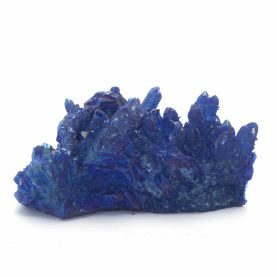 Cobalt Aura helps deal with constraints of self-expression that may hold one back in life, relationships, or the workplace. 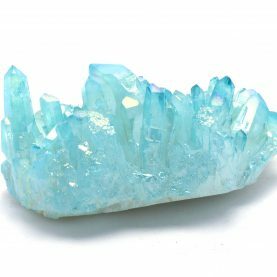 This crystal increases clairvoyance abilities. It enhances one’s own healing powers, especially when an illness is unresponsive to treatment or a patient is exhausted from prolonged medical intervention. Clear Quartz bonded with Gold and Titanium; produces vivid multi-colored metallic crystals. Rainbow Aura activates the chakras in the body, helping energy to move freely through the subtle bodies. It is particularly supportive for those in dysfunctional relationships, by letting one see what lies ahead and helping to release negative emotions such as resentment or grief. It brings deep insights into one’s relationships at all levels and helps in letting go of karmic ties that may be hindering relationships in the current life. Rainbow Aura is a master healer for any condition. Clear Quartz bonded with Silver and Titanium; produces vivid multi-colored metallic crystals. 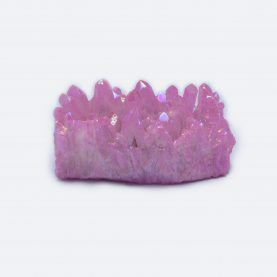 The gentle energy of Rose Aura stimulates the pineal gland and the heart chakra to transmute deeply held doubts about self-worth. It is helpful in dealing with issues pertaining to their body image, abuse, or rejection. 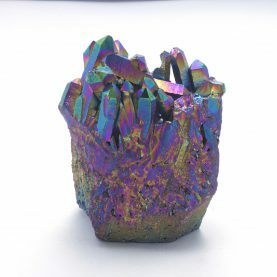 The Aqua Aura Quartz is used for healing and is a potent stone for activating chakras. It has a calm, relaxing effect on the emotional body and is exceptional for releasing negativity and stress, soothing and healing the aura. It brings peace during meditation, opening gateways to the angelic realm. It is believed to strengthen the thymus gland. Clear Quartz bonded with Platinum, sometimes with additional Gold or Silver; exhibiting a lovely raspberry rose sheen. 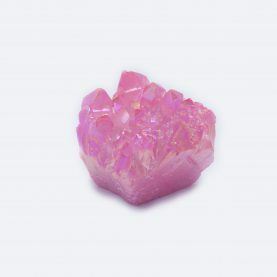 The gentle energy of Rose Aura is uplifting and produces a frequency that stimulates the pineal gland and the heart chakra to transmute deeply held doubts about self-worth. It is helpful to those who deal with issues pertaining to their body image, abuse, or rejection. 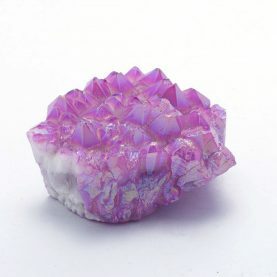 This crystal makes a powerful connection with the love of the higher consciousness and bestows unconditional love of the Self. Clear Quartz bonded with Platinum, sometimes with additional Gold or Silver. It is like Rose Aura Quartz but has a ruby red sheen. Ruby Aura brings love, passion, and vitality, and activates wisdom of the heart. It cleanses the root chakra of old survival issues, and is a protective crystal against aggression and violence, helping to heal the effects of physical abuse, especially in children. It transmutes negative emotions such as rage or resentment and is spiritually uplifting. Healing Properties Clear Quartz bonded with Gold and Indium, or with Gold and Iron/Iron Oxide. Also called Champagne aura quartz. 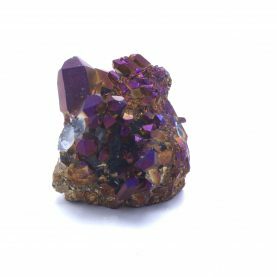 It is a high vibrational crystal of transmutation and spiritual harmony, helping one to ground energetic and psychological changes into the body and to put one’s spiritual ideals into practice. It stimulates the sacral and solar plexus chakras and is excellent for building trust one’s own intuition. It re-energizes those who have worked in these professions for years and have encountered blocks to their progress or lost enthusiasm, to reclaim their dedication and passion. As a business support stone, it assists in all areas where negotiation and the resolution of conflict is required. 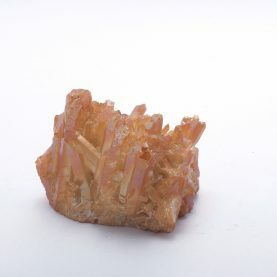 Clear Quartz bonded with Gold and Iron; produces a bright, shimmering yellow-orange iridescence. 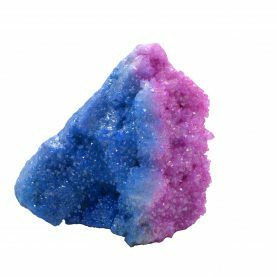 This crystal has a dynamic energy and is deeply supportive of spiritual exploration and gaining profound insight. It uplifts one's spirits, makes one more responsive and imparts the ability to face life’s challenges with equanimity and cheerfulness. It brings combines clarity, insight, and perspective with strength to help the mind analyze and categorize. Tangerine and Tangerine Sun Aura aligns the physical and subtle bodies. 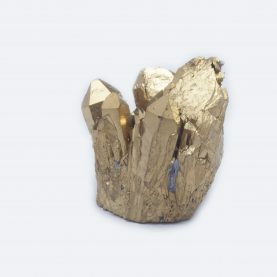 Clear Quartz bonded with Gold and Indium, sometimes with additional Niobium. 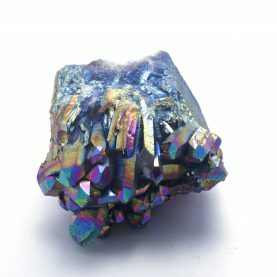 It is also called Azure Aura Quartz. Tanzine Aura helps connect with Archangel Raziel, the Archangel of mysteries and esoteric knowledge. It opens and aligns the soul star and crown chakras, drawing cosmic energy into the physical body and to Earth. It is excellent for meditation and being centered. Tanzine Aura offers deep spiritual comfort, dissolving emotional blockages and replacing them with unconditional love and the sense of being part of the whole. Tanzine Aura regulates the pituitary and pineal glands.